Romance, relaxation and recreation await when you stay at Heavenly View. 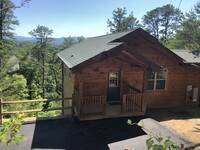 The 1-bedroom log cabin is surrounded woodlands, so you can be sure of peace. At the same time, it’s just 10 minutes from the Gatlinburg Arts and Crafts Loop, an 8-mile trail of galleries, studios, and shops, and from the Great Smoky Mountains National Park, where you can hike, bike, and ride horses among wildlife, wildflowers, and waterfalls. The restaurants and amusements of downtown Pigeon Forge are less than 5 minutes away, and Dollywood is just a 5 minute drive! 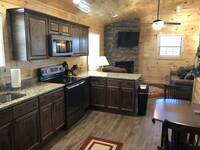 Once you step inside the newly constructed cabin, though, you might be tempted to spend most of your time there—it’s that charming and comfort-filled. 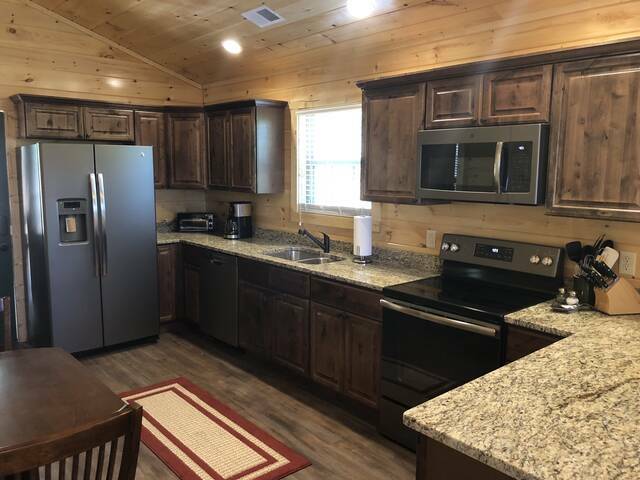 With wood-planked walls and ceilings and plenty of windows to let in the fresh mountain breeze and the spectacular views, the interior of Heavenly View is everything you want in a Smoky Mountain cabin. The plush sofa is designed for nestling with that special someone as you watch a movie on the large flat-panel TV, play Scrabble at the coffee table, or linger over drinks by the stone-surround gas fireplace. The dining table is ideal for a romantic dinner for 2. The kitchen has all the appliances, gadgets, pots, pans, and tableware you need. There’s even a dishwasher because there’s nothing romantic about scrubbing plates! You might want to bring those frosty margaritas out to the back deck. Thanks to the lack of competing lights, you’ll be dazzled by the abundance of stars in the night sky. 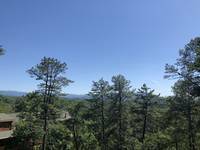 Of course, the view in the daytime is magnificent too: Towering trees rustle in the breeze as eagles soar across the seemingly endless skies. Take it all in from the deck chairs or, better yet, from the hot tub. As well as romantic luxuries, Heavenly View provides plenty of conveniences too. For instance, clean towels and an impeccably made-up bed will be waiting for you when you arrive, so you can leave your own linens at home. In fact, you can pack especially light, as the cabin has a washer and dryer. However you decide to spend your days, you’ll love coming back to Heavenly View. Cater to your inner romantic, and make your reservation today!